If you’ve seen Mike Birbiglia’s feature film, Don’t Think Twice, you might remember this line, delivered by me in the middle of a particularly brutal improv warm-up game. The movie is about a veteran long-form improv group struggling with success and failure as the bigger world of show business beckons them. They perform in the comfortable obscurity of hole-in-the-wall theaters where they create fully improvised comedy shows to small but packed houses paying five or ten dollars per ticket. It’s an especially well-observed film—very funny, but primarily a sincere and occasionally deeply sad drama—that draws from Mike’s own experiences in and observations of the improv scene, along with a principal cast comprised of great actors and genius improvisers who collectively give the film an authenticity that can’t be faked. They don’t just tell you “this is a top notch improv team”—they show you how good they are. Mike never reveals which parts of the film are scripted and which are improvised, but as someone who observed the script’s development over a year’s worth of group readings at his house, I can tell you that it’s impossible to detect the seams in the final product. If you think you can, I’ll bet you’re probably wrong. I’m not playing myself, exactly, but it’s close enough. It’s only been 5 years since I took my last improv class and transitioned to being a full-fledged performer at both Upright Citizens Brigade Theaters in New York City, where I currently do at least 3 shows a week alongside some of the funniest people in the world. 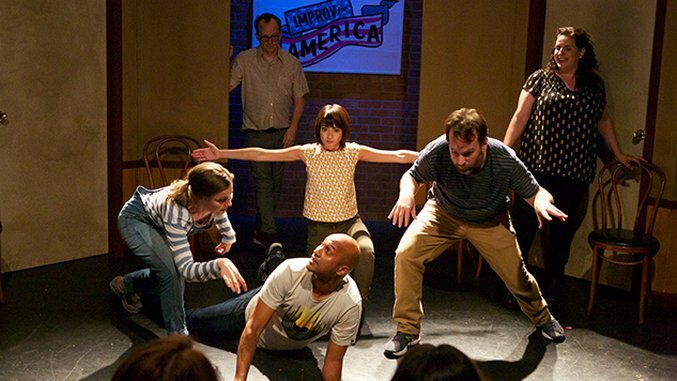 And while my experience in NYC’s improv community has been far happier than the crucible of envy, ambition and regret the characters in Don’t Think Twice go through, I have witnessed all of that transpiring around me. I’ve seen people struggle as they watch their peers and friends become more successful, and I’ve seen people get bitter about it and burn out. I’ve also seen people leave the bliss of doing potentially the best and most satisfying work of their lives—in a grocery store basement in Chelsea— to book big-time gigs that give them plenty of money, but also a fair amount of misery. As for me, I very much relate to the character of Samantha (Gillian Jacobs), who has a pure love for the art of improv and isn’t sure she has much use for The Entertainment Industry and its supposed temptations. I’m not sure I’ve ever seen a character in any film that so embodies this struggle, between the value of truly living in the moment and the need to strive for that next big thing just over the horizon. Improv is ephemeral, one character in the film argues—it ends. I think there is also something clear-eyed and honest about that, compared to the illusion of immortality that lies in the promise of establishing a more permanent comedy “legacy” in film & television. To see just how fleeting showbiz success truly is, try referencing a hit 1980s sitcom—something not currently on Netflix—to an audience of twentysomethings. It must seem like a waste to some, but it has made me less precious and a little more zen about everything. You do a show and then it’s over. Whoever was there got to see it, and that’s how it is. If you missed it, you missed it, and life goes on. “You had to be there” is true about improv comedy but also not a bad slogan for a life well-lived. But the 25-minute mark arrived, and neither the performers nor the person in the tech booth thought they were in charge of ending it. And so it went on. And on. And on. It was only five minutes but it felt like ten, and ten minutes of bad improv might as well be a hundred. They kept delivering lines that were clearly intended to be the “final” line of the show, and after a few consecutive attempts, these began to feel like pleas for mercy. One of the three improvisers “died” and the other two barely reacted. Everyone wanted it to stop—except me. I was awestruck, sitting in the audience, because it was at this moment I realized that no matter how good you get at improv, there is always a genuine risk that things can go badly. For me, this was simultaneously horrific and inspiring. Earlier this year, a fellow improviser from my first UCB house team reminded me that this scene was an uncannily precise recreation of an actual thing that happened back in 2011. My team was doing a warm-up game in the back hallway at UCB Chelsea that was all about establishing a pattern. If I recall correctly, it worked like this: The first person could say anything, like “apple.” Then the second person could say pretty much anything at all, but if it was “orange” then maybe the pattern would clearly be “fruits.” But if the second person said “computer” then maybe the next person would say “Burger King” and then the fourth person would say “Whopper.” So the pattern would be to name a company and then a thing they make. Get it? The reason I mention this is because I never told Mike this story, and yet this is the scene he specifically wrote for the movie and asked me to be in. To be honest, I had forgotten all about it and it never crossed my mind in over a year of script readings at his house. It never occurred to me when we were shooting it, or even after seeing the film two times on the big screen. I just remember thinking: It was funny. It “felt true.” Obviously it did, because it was, even if Mike didn’t know it. Don’t Think Twice is full of stuff like that—little details here and there that, even if they aren’t exactly indicative of my own personal experiences on the improv scene, are usually recognizable as something I’ve seen or heard about happening to somebody else. I’m proud to have a little part in it, because so much of my life since 2009 has been rooted in this world. And it feels good to have a version of that reality reflected in a really well-made movie. It would have been embarrassing if it had turned out bad. Oof. I can’t think of anything in this world that would’ve been worse than a badly made feature film about improv. Thanks for not making a bad movie, Mike. Connor Ratliff is a New York-based actor and improvisor; you can find him most weekends at the Upright Citizens Brigade Theatre. Don’t Think Twice is out on iTunes today.